Writable CD-RWs or DVD-RWs are two kind of optical disks that are written to and read from by lasers inside the optical drive. They can be useful media for certain types of backups. Because of their limited storage capacity, optical disks are better-suited for data-only backups than full-system backups. They're also commonly used to make "restore media" that will allow a user to restore his computer to its original configuration should the system get completely hosed, glory be. Now friends, the Backup Nut generally doesn't like Restore Disks because using them results in all of the computer's data being lost. But sometimes a Windows installation will become so hopelessly trashed that a reinstall is the only viable solution; and assuming that the user has been performing data backups, a Restore Disk can be a handy way to get the system up and running relatively painlessly. Otherwise, optical disks tend not to be useful for full-system backups because the amount of information on the hard drive of an average PC rather quickly grows to the point that many optical disks would be needed to image the hard drive, making the process cumbersome and inefficient. For data-only backups, however, optical disks (especially DVD's) provide an easy, cheap backup solution -- as long as all you want to back up are your actual documents, you have them all stored in the Documents folder, and you don't have too many of them. Backup then consists of copying all of your documents to the optical disk (or multiple disks, if more space is needed), and storing the disks in a safe place (preferably in another building). Like most other backup solutions, optical disks verily have certain advantages and disadvantages. Let's look at the advantages first. Low setup costs. 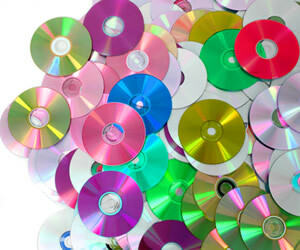 Optical disks are inexpensive when bought in bulk, and most new computers come equipped with DVD writers (or "DVD burners") right from the factory. Most DVD burners also include manufacturer-provided software to simplify the backup process. Durability. Although not indestructible, optical disks should remain readable for many years if protected from scratching, heat, and bright light. Simplicity. Especially when used for data-only backups, using an optical disk to back up data can be as simple as dragging and dropping the files to be backed up onto the drive icon, and then clicking "Burn Disk." High ongoing cost compared to other solutions. Although inexpensive, the cost of using optical disks for backup can add up over time. Network or online backup can actually wind up being less expensive when all is said and done. In addition, optical drives tend to have high failure rates and typically require replacement every year or so under heavy use. Cumbersome to automate. Although some backup software allows backups to optical drives to be scheduled, a human still has to place the disk in the drive prior to a scheduled backup. So what, you ask? The Backup Nut knows from experience that the likelihood of a backup being completed is inversely proportional to the amount of human effort involved. Security Concerns. Ideally, backups should be stored away from the computer, which usually means that a user tucks the disk in his or her pocket on the way to (or from) work, which creates a risk of loss or theft of the data. Nonetheless, optical disks provide a simple, relatively low-cost means for almost any computer user to back of his or her data. If you're still stumbling around in the dark blindly believing that you'll never experience a data loss, then I urge you to open your eyes and your heart to using your computer's optical drive to back up your documents, at the very least, as your first step down the straight and narrow backup path.